Edited after being accused of stealing this tutorial: I wrote this tutorial for Craft Snob as a participant in her handmade ornament parade. I am just reposting it here on my blog. 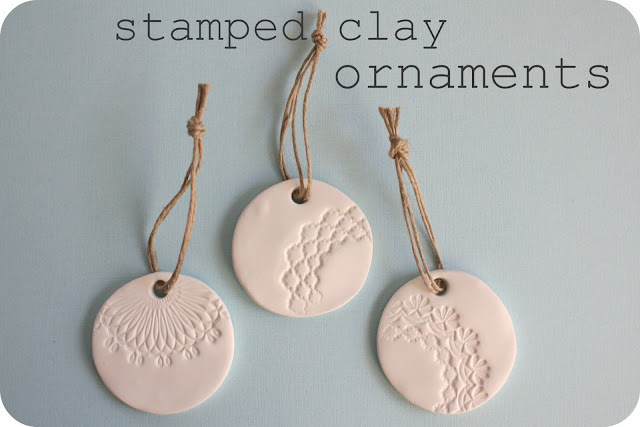 This post was originally posted on Craft Snob as part of her Handmade Ornament parade. You can see the original post here if you'd like. They are really easy to make, and would be a great craft to do with kids with different shaped cookie cutters and stamps. Start by conditioning your clay. You just want to knead it in your hands until it is smooth and easy to work with. This is the longest part of the project, but it is an important one. If you don't condition your clay enough, your baked ornament could be brittle. 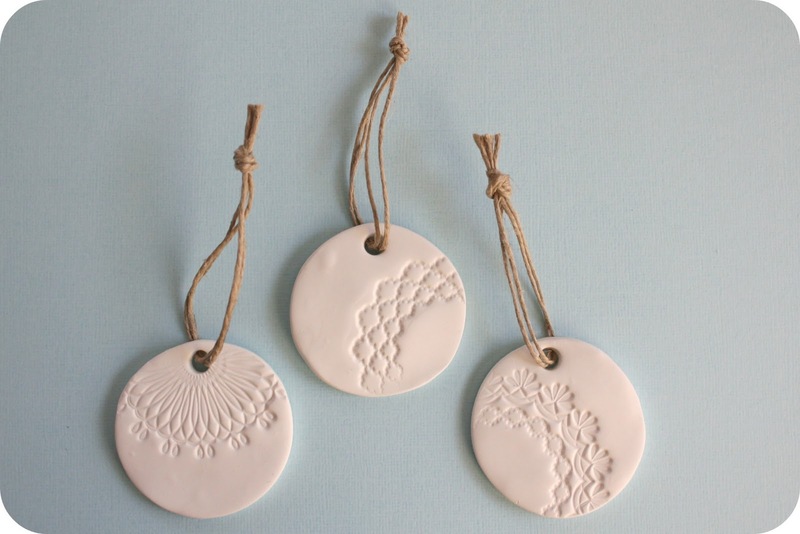 Once you have conditioned your clay, roll it out and cut into circles using your round cookie cutter. Christmas shape cookie cutters would also work great. 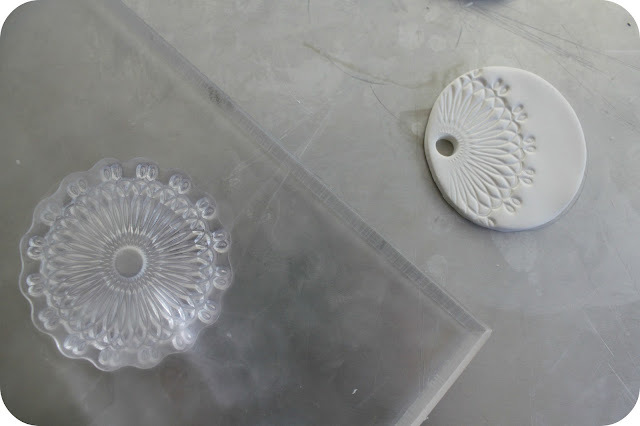 After I had my circles cut out, I used a clear doily stamp set to make impressions on my clay. 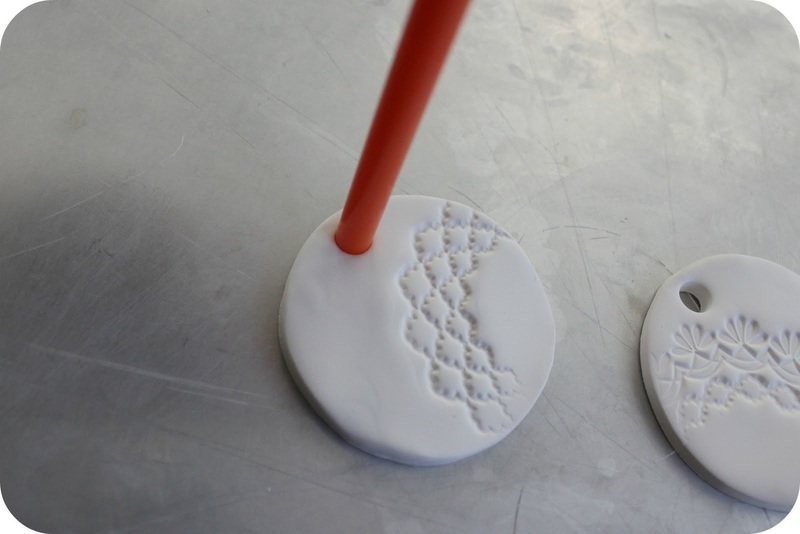 Use a straw to make holes to string your ornament. Bake according to directions, let cool, and string with twine. Just a reminder - any cookie cutters/straws used for these should not be used for food prep again. You probably already know that. Stay tuned for lots more Christmas projects coming up. I am trying to hold off for all those who get annoyed by Christmas before Thanksgiving. Personally, I say bring it on. I have been listening to Christmas tunes for a month, started my shopping, and I even got mocked by a lady at Hobby Lobby last week for being one of THOSE people who put up their trees early. It was very nice of her considering I had a 5 foot tree and a screaming toddler in my cart. Spreading the Christmas cheer early, I suppose. I made similar ornaments in my pottery class, but maybe I'll try some like these when my class ends. I always have pottery withdrawal between sessions. Did you get permission from the original author to totally lift her complete tutorial? I know you linked back to her. But as a blogger who can spend an entire day on a tutorial, I would be so annoyed/frustrated/angry if someone did why you have done. Just saying, it is so very uncool to see stuff like this. Why not just show the finished product and "force" more viewers to her blog.. she deserves the credit. Anonymous - I did not in any way lift her tutorial because I WROTE the tutorial as a guest post on her blog. It is MY tutorial. She asked that I write a tutorial for her and then I would be able to also share it on my blog three days later. You could have emailed me to clear this matter up rather than post accusatory remarks. I try to always be nice and considerate when giving credit, and I would NEVER steal anyone's work. Allison, I am really sorry. Damage done I know.. but still very sorry. I love this, so simple, so beautiful, thank you for taking the time to post this tutorial, I'm a blogger too and understand the time it takes to put instructions and photos together, plus the actual crafting itself. So excited to make some of these. These are so beautiful and so simple. Thank you for posting!! These are so lovely and elegant. Thanks for the tut. Love love love... These are so gorgeous! I wanted to let you know that I have linked to this project on Christmas-Projects.com on this page: http://www.christmas-projects.com/html/tree_ornaments.html! I am thinking of trying this out myself. I know a lot of people who would love getting these as gifts! 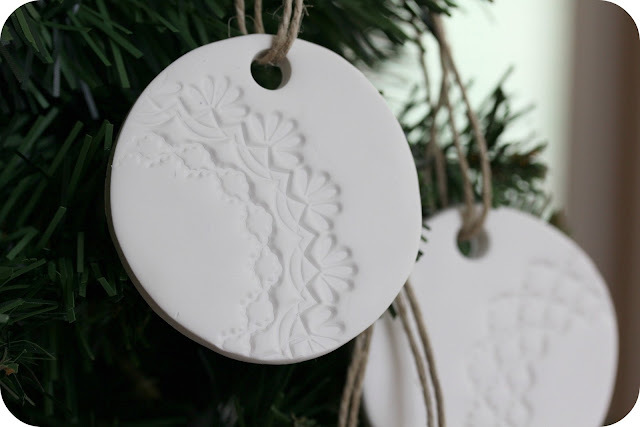 Wow, I just saw your tutorial and absolutely love that you used a doily stamp. Do you know where I could purchase a similar stamp? I haven't seen these stamps in the craft stores. Thanks!